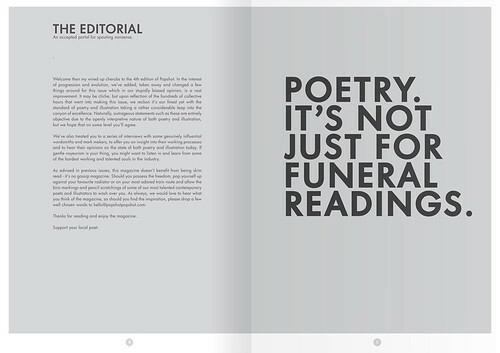 Popshot Magazine is a bi-annual publication that brings together poetry and illustration with an eye for print design. Launched in 2009, we’re now up to issue 4 of this bi-annual magazine. 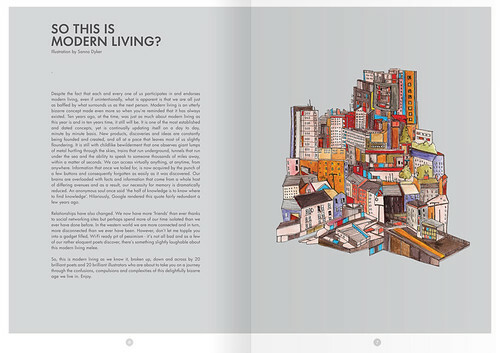 The current theme is ‘Modern Living’, and Eye caught up with editor Jacob Denno to talk about publication, poetry and Popshot’s disengagement from ‘the clammy hands of tweed jackets and school anthologies’. Top: cover illustration by Nick Cocozza . 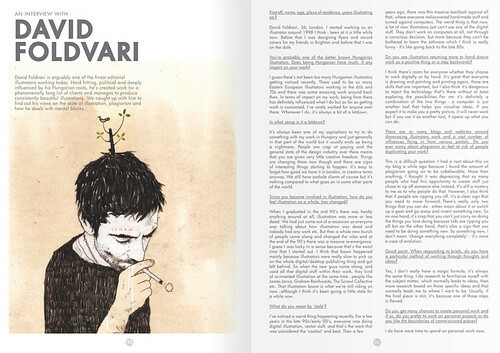 Above: Interview with (and illustration by) David Foldvari. Eye: How did the magazine get started? Have you been involved in editing / designing publications before? 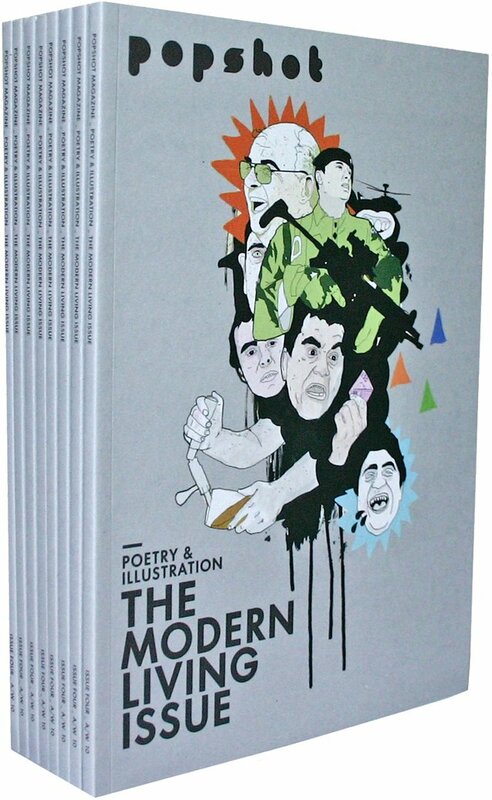 Jacob Denno: The magazine was born out of a slight distress at how disgustingly produced most poetry magazines were. An afternoon spent perusing the literary section at the now defunct Borders was enough to convince me that there was a need for a magazine that paid attention to both poetry and design. My previous experience with magazine design was virtually non-existent as I had always been more involved with making half baked, lo-fi zines rather than highly produced publications. Above: Illustration by Sanna Dyker. 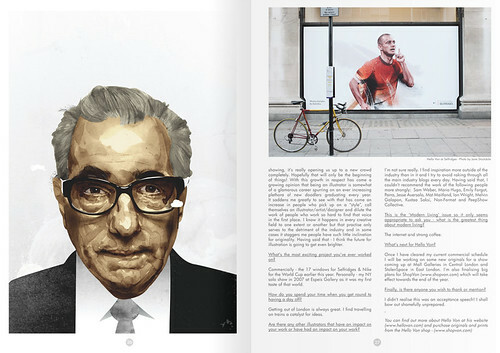 Below: Interview with (and illustrations by) Hello Von. Eye: Which illustrators do you like to work with? JD: I've had the pleasure of working with some incredible illustrators over the past four issues of Popshot – people like James Dawe, Holly Wales, Paul Holland, Dan Hillier, Richard Wilkinson, Mydeadpony and so on. The best illustrators are the ones that actually sit down with the poem and think about what it’s trying to say and what it means to them. You can tell when an illustrator has just fired out an illustration in a rush because it never works. As a general rule, the best illustrations in the magazine come from the illustrators who enjoyed exploring and working with their poem the most. Eye: The magazine seems to be doing really well – what are your ambitions for the future? JD: To expand our readership, get the magazine into more countries, keep on improving the design / layout / content and eventually, be the first result in Google when people type in ‘brilliant’. It’s a tall order. 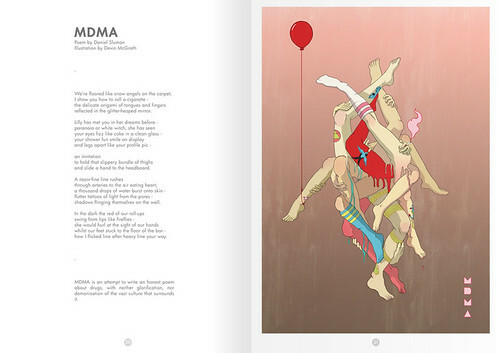 Above: Poem by Daniel Sluman, illustration by Devin McGrath. Eye: Your website says you are ‘gently intent on hoodwinking poetry back from the clammy hands of tweed jackets and school anthologies’. How is the mag going down in the stuffier circles? JD: I think the magazine will have gone down rather horrifically in the more staunch and traditional circles – which is exactly what was supposed to happen. My main interest is in trying to get new audiences into it by using design and illustration. The style of poetry is simpler and a lot more accessible which hopefully is pulling in younger and more diverse audiences. Every once in a while we’ll get an email or a message from someone who has come across Popshot in a bookstore and was so surprised they liked the poetry that they’re willing to give it a chance. Hearing stuff like that helps affirm that we’re doing something right, somewhere. 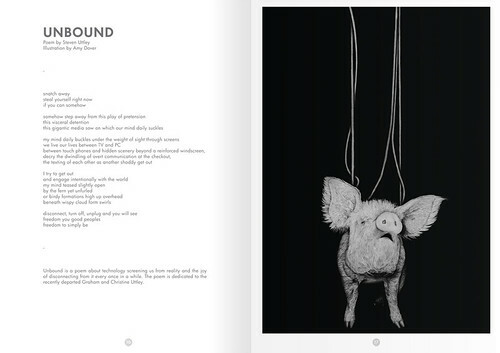 Below: Poem by Steven Uttley, illustration by Amy Dover.